Chicken Cemani - Ayam Indonesia. Just to SHARE the story Hobby, Good for the Ceremony, Private Collections, Gifts for relative or friends and/or resold for profit is bigger. Subject Availability. If today you are looking for rooster/chicken cemanis , female or male - rooster, ranging from the ordinary to the black-tongued, then you are in the right place but subject stock available. Here are and I, the guardian of the owner of cemani and breeders not THE MEDIATOR. Indonesia call Ayam Cemanis, by English chicken - Ayam is the Malay and Indonesian word for chicken but the word cemanis also means black in Javanese. A chicken which has the dominant black color on the nails, skin, feathers, beak, eyes, flesh, bones, and tongue, and even sometimes there is also a blood black in color. Chicken – ayam cemani by certain circles are believed to have that are sought. These birds are beautiful and very rare. Extremely difficult to find. Entire black including flesh. The breed is found in Java, Madura Island and in Sumatra. Include some part of Indonesia. Some people go to highland or forest to find Ayam Cemani, first came into being in Sumatra, Indonesia. Since in that same area a wild population of jungle fowl exists, a good guess is that the Cemanis descend directly from this population. Because of its rather "normal" land race type and build (unlike Sumatra). The "real" Cemani is extinct, and that through crossing with ayam Kedu, some they called ayam Kedu - Cemani was developed. I have reason to doubt this, because Cemanis that are bred in the Kedu area are still a different type of bird altogether than the ayam Kedu. The ayam Kedu is a typical utility breed with good productivity and believe that a population of more or less pure cemanis still exists in Indonesia. 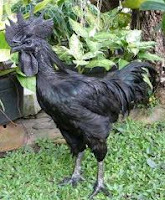 This is, because pure black chickens have always had a distinctive use in ceremonies and traditional medicine, in Indonesian and Malaysian cultural history. 2011 Site Maintenance and Designed by chickenindonesia. Simple theme. Theme images by Nikada. Powered by Blogger.